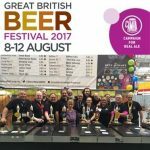 We are delighted to have our inaugural beer at the Great British Beer Festival. Saffron Citra is featuring at Ben’s Bar (B11). If you haven’t been able to get down to Olympia this year, why not pick up a case of bottles or a bag in box and sample the Citra. Available in local Waitrose stores and a selection of farm shops and delicatessens. Tried it at the GBBF?? We welcome trade enquiries from venues within a 30 mile radius of the brewery.